Comments: Available online. 4 vols currently. 158 pages. 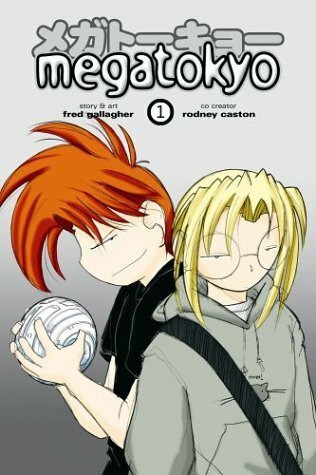 Summary: Megatokyo is the story of Largo and Piro, two guys in their mid 20's who are obsessed with games and their adventures in Japan. The first volume starts out with Piro and Largo heading to Canada to try and get into the E3 expo to see all the woders they have heard about. For Largo and Piro E3 is like Shangri-la, you see Piro and Largo have no lives and don't really care. They found what they love in life and are rather happy pursuing their inane hobbies. The problems come when they find that they can't get in, it is only for VIP's only. They try all kinds of ways to get in and when Largo finally learns that they won't be able to get in Largo gets drunk, moons everyone and gets himself kicked out. With Largo passed out Piro decides to make thngs right by buying a plane ticket to Japan to make themselves scarce for a while. When Largo wakes up he finds himself on a plane heading to Japan. He asks Piro what is going on and after finding out that it was all Piro's idea to head to Japan he tries to strangle Piro, later when he finds out what he did hile he was drunk he is almost glad to be heading to Japan. Largo and Piro quickly find gaming stores in Japan and are back in their own world of anime and games. Soon the pair meet up with a friend of Piro's and live at his place for a while. Soon Piro and Largo spend all of their money on manga, anime, and games and have no more money for the trip back home and their friend Tsubasa's patience begins to be tested a bit. Along the way we meet Piro's conscience Seraphim, a small winged angel who sits on his left shoulder, but has a mind of her own and works for the agency. Largo's conscience is a hampster named Boo, of all things, and does the best he can under the circumstances. Personally I think that Largo influences Boo more than the other way around. Largo and Piro are two completely different people. Largo is a lot of fun for me. He has a loose enough grip on reality and sees things in a very different way than Piro does, especially since Largo does not understand Japanese. Because of the language barrier Largo sees things that most people do not see and can live in his own world easily enough. Largo sees finds of darkness everywhere and feels he must battle the forces of darkness where ever they may be found. Piro on the other hand is obsessed with dating sims and all things Japanese. He considers himself pathetic in all things and enjoys a fantasy life as well with his dating games. Piro sees the world more like you and I do, but Piro definitely has his problems with reality as well, though neither of them really recognize it. It is hard to say if either of them can see the world in the wrong way actually. I think they both see what the other does not see. Piro is funny in that he is easily intimidated by girls. He is also easy to feel sorry for as well. Megatokyo volume 1 is almost a parody comic of Japanese manga, and is hilarious to see them bumbling through life in Japan. Nearly every comic has a commentary under each comic that is a treasure trove of behind the scenes information on the ins and outs of the comics and what goes into making a manga. The artwork is beautiful and the reader can drown in the pictures or just laugh at the crazy antics or immerse himself in the romance of the story, which is what I do. This second edition is filled with drawings from Piro's sketchbook, which are a lot of fun. I do not read manga all that much to tell the truth, but this is one I thought was worth mentioning. Where Found: borders, barnes&nobles, amazon, etc.